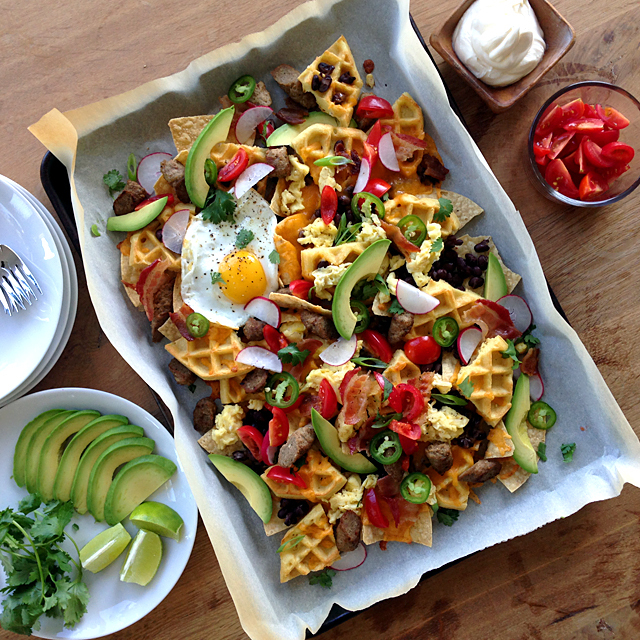 Recipe for Breakfast Nachos with Hash Browns “Chips” first. Additional suggestions and personal notes follow. 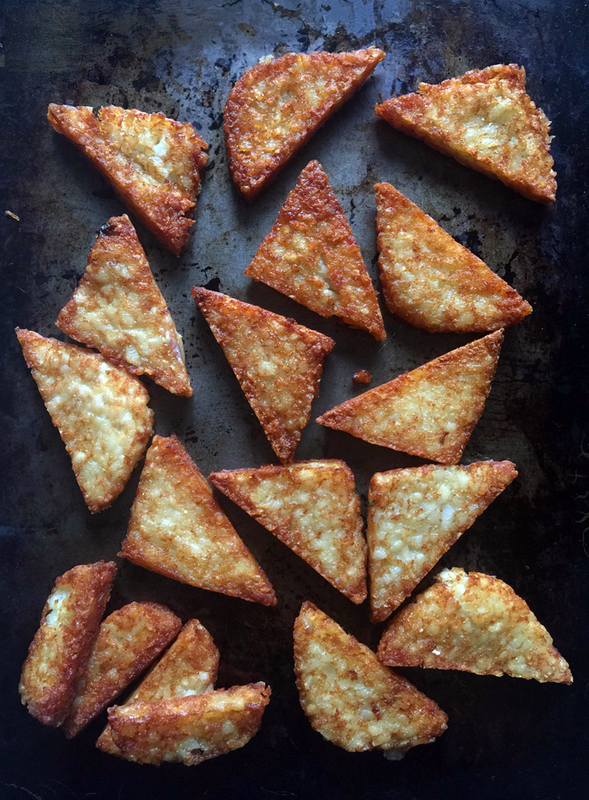 Fry the Hash Browns: While the hash brown patties are still frozen, cut each one diagonally (on the bias) into triangles. See photo below for guidance. The hash brown patties I bought were more oblong, so I cut off a small portion of one end to create a square first, the cut diagonally to make triangles. The hash browns have to stay frozen up to the point of frying or they will break apart in the pan. When all the frozen hash browns are cut and ready, heat about 1-inch of oil in a frying pan with high sides over medium-high heat. Prepare a plate with several layers of paper towels nearby to drain the fried hash browns of oil. When a small corner from a hash brown patty dropped into the oil starts bubbling, the oil is ready. Place a few of the hash brown triangles in the oil. When the hash brown triangles are golden brown on the underside, after about 4 minutes, turn them over and brown the other side. Remove fried hash browns to paper-towel lined plate and cook the remaining hash browns in the same way. Assemble the Nachos: Turn on broiler in oven to high. 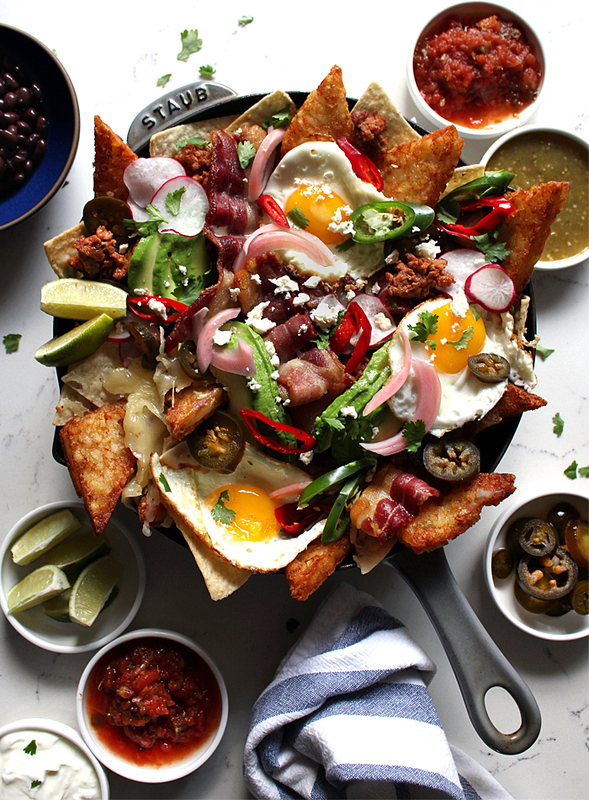 In a large cast-iron skillet, spread out a single layer of tortilla chips mixed with a few of the hash brown triangles. Top chips and hash browns with a handful of shredded cheese and about half a cup of black beans. 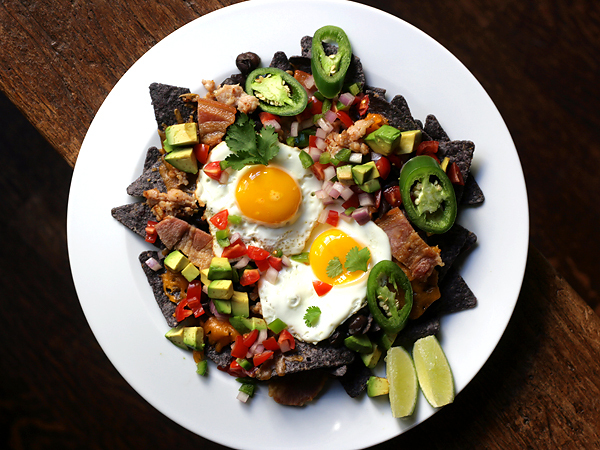 Spread another layer of tortilla chips and hash browns, then shredded cheese, and black beans. If you are using pre-cooked/leftover bacon and chorizo that is cold from the refrigerator, you can add to the nachos now so they warm as the cheese melts in the oven. Just be sure to watch closely so the cooked bacon and sausage don’t cook so much more to the point of burning.Otherwise, if the bacon and chorizo are hot, wait, and add them after broiling. Place skillet under broiler, about 6-8 inches from the heat. Watch carefully, and remove once the top layer of cheese has almost completely melted. 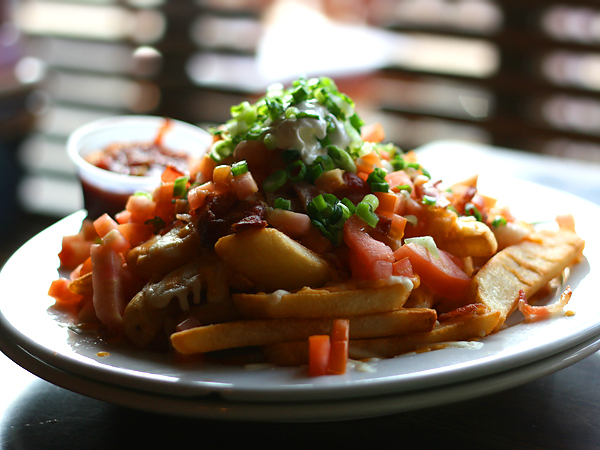 It’s okay if the chips get toasted on the tips. Ours took about 8 minutes. While the chips and cheese are broiling, fry the eggs. You can discard the frying oil you used for the has browns, wipe out the frying pan, and use it to fry the eggs. Remove the cast iron skillet from the oven. If you are using a separate serving plate, slide the chips/hash browns/melted cheese onto it. But why dirty yet another dish? Serve the nachos straight out of the skillet, just be careful, the pan is hot. 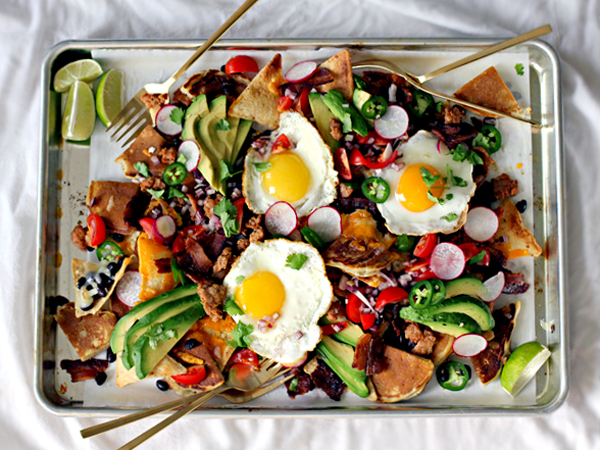 Top the nachos with the cooked bacon, chorizo, and additional black beans if you’d like. Place the fried eggs on top. Add the crumbled feta or cotija cheese, sliced fresh avocado (or guacamole), pickled onions, sliced jalapeños, sliced radishes, and chopped fresh cilantro. 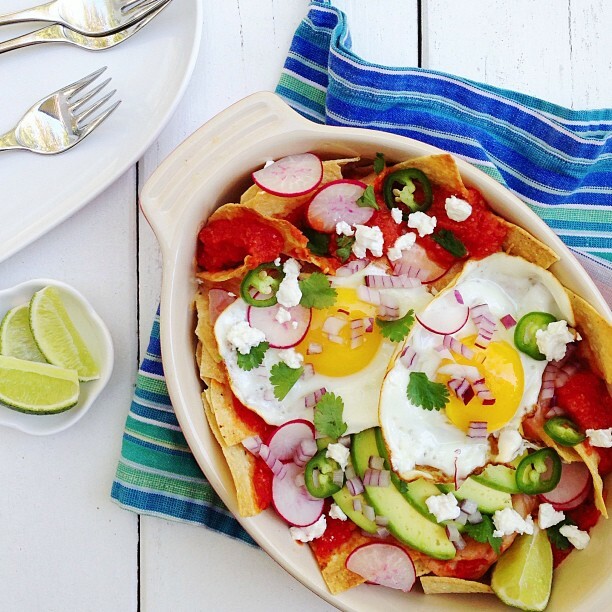 Serve immediately, with salsas, bottled hot sauce, sour cream/yogurt, and fresh limes. Hash Browns: in the local grocery store’s frozen section where the frozen vegetables are. The ones I found were labeled “hash brown patties” and come in a small plastic wrapped box. The hash browns are shaped like rectangles with rounded corners, almost exactly like the hash browns served for breakfast at your favorite fast food drive-thru. 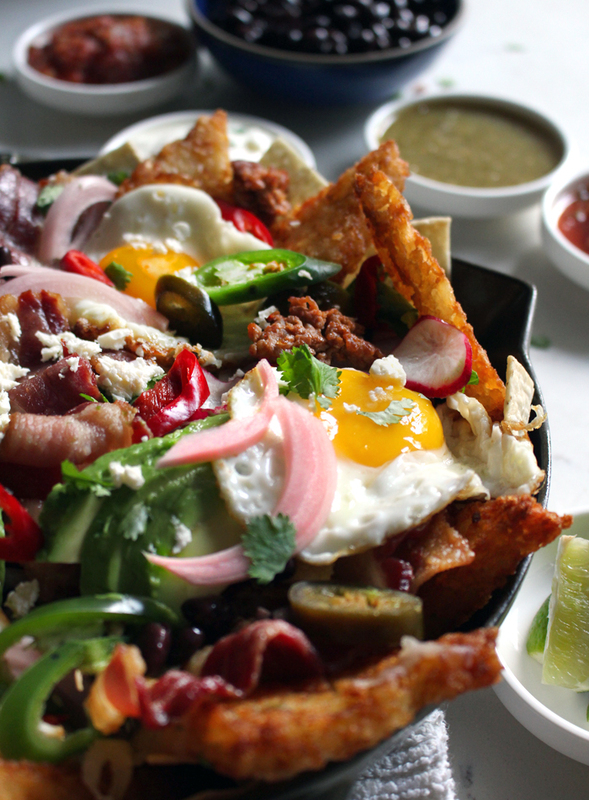 Tortilla Chips: Use thick, sturdy restaurant-style tortilla chips that can stand up against the weight of melted cheese mixed with beans, bacon, and chorizo. Bacon: Use regular thickness, uncured bacon. Extra-thick bacon will be too heavy for the hash browns. Chorizo: I found spicy, Mexican-style chorizo in the refrigerator section at Whole Foods Market. Get the kind that looks like a solid pack of ground meat, not sausage links. Crumble the chorizo in the pan as you cook it. Cotija Cheese: is a dry, crumbly cheese that’s pretty mild in flavor. Feta cheese is a good substitute because it has the same texture, but feta has a slightly stronger, tangier taste. It probably won’t matter because of all the other flavors in the nachos. The cotija/feta is really there for the salt. Pickled Jalapeños: though I generally shy away from anything outrightly labeled “sweet,” I am obsessed with “sweet and spicy” pickled jalapeños, which I accidentally bought a few weeks ago for a different dish. They are in a jar in the grocery aisle with jarred pickled peppers, capers, olives, and marinated artichokes. All fresh herbs and produce from either the Santa Monica Farmers’ Market on Wednesday, or Whole Foods Market when I can’t find what I need at the farmers’ market. Speaking of wine, I know we weren’t actually talking about wine, but inexpensive sparkling wine is perfect with these string, salty, cheesy nachos. 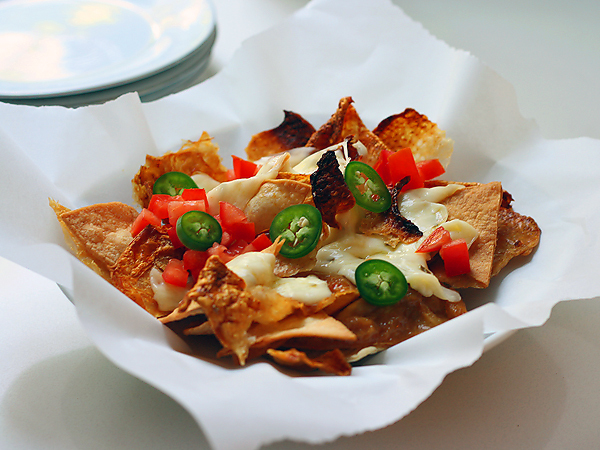 “Nachos” is one of the Epic Tailgate Party Foods, #18 on the 50 Things to Eat Drink Do Wear for Fall Bucket List.